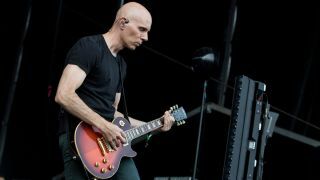 Following his '90s stint as a guitar tech for bands such as Smashing Pumpkins, Faith No More and Tool, Billy Howerdel joined forces with Maynard James Keenan to form A Perfect Circle. Though Ozzy guitarist Randy Rhoads inspired the young Howerdel, you can also hear the atmospheric and emotive influence of indie-rockers Depeche Mode and The Cure in A Perfect Circle’s sound. We’re taking a look at a handful of Howerdel’s signature techniques and songwriting approaches. Try our tab examples out for yourself and you’ll soon assimilate some of the APC sound. To recreate the vibe of Howerdel’s heavier tones we’ve recorded our examples in C# standard tuning (C# F# B E G# C#) - so every string is tuned three semitones lower than standard. If your guitar is set up for standard tuning try using a set of heavier gauge strings. The tone we’re looking for here is more hard rock than metal, so dial in plenty of midrange and use the gain sparingly. The 6/8 feel is prominent throughout the band’s back catalogue and this Outsider-inspired riff in the similar 6/4 time shows how Howerdel might switch between powerchords and arpgeggios. Count '1 2 3 2 2 3' to keep time and synchronise your picking in a constant down-up motion to lock in. Here we’re using a minor 9th arpeggio similar to the wide interval lines in The Hollow. You’ll need to use all four fingers to fret the notes one at a time while using your pick to smoothly sweep up and down the strings in a gliding motion. This clean 3 Libras-style riff uses a two-note F#5 powerchord on the middle two strings as various bass notes change beneath. The bass notes spell out the F# Phrygian mode (F# G A B C# D E) - an ominous flavour often heard in APC’s music. This riff creates a solid bed of sound, using the low C#5 powerchords and notes from the C# minor pentatonic scale (C# E F# G# B) to spell out a riff. Here a second guitar plays contrasting octaves over the previous riff to create a cool, melodic hook. Use chorus or delay effects to add texture.